The Brown County Humane Society offers the following services to our community. Surrendering a Pet – Learn about the process for surrendering your pet to the shelter. Lost and Found Pets – To report a lost or found pet, call the shelter at 812-988-7362. Get resources on what to do next. 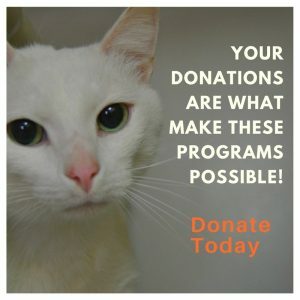 Barn Cat Program – To inquire about adopting a barn cat, call the shelter at 812-988-7362. Spay/Neuter – To make an appointment to have your cats or dogs spayed/neutered, call 812-703-0797. Learn more about spay/neuter. Trap-Neuter-Return (TNR) for Feral Cats – Learn more about TNR and why it is the most humane and effective method to control cat overpopulation.